Agincourt 600th Anniversary – History… the interesting bits! 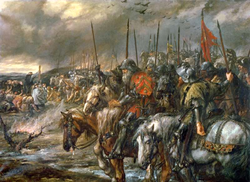 This Sunday, 25th of October 2015, marks the 600th anniversary of the Battle of Agincourt. One of the greatest battles in English history, it epitomises the pinnacle of English successes against their traditional enemy, France, during the epic struggle of the Hundred Years War. But what started it all? The origins of the Hundred Years War go back 200 years before its outbreak, to Henry II. His marriage to Eleanor of Aquitaine meant he was not only Duke of Normandy in the north of France, but Duke of Aquitaine in the south. And his accession to the English throne in 1154 brought all these French possessions to the crown of England. This made for the awkward position that the sovereign of England was technically a vassal of the King of France, causing no end of squabbles and friction for years to come. Wars broke out frequently and the French gradually ate away at England’s French possessions. It all came to a head with a crisis in the French monarchy. When Philip IV, the Fair, of France, died in 1314, he was successively succeeded by each of his 3 sons; Louis X, Philip V and Charles IV. Only one of these kings produced a son, King John the Posthumous was born 5 months after the death of Louis X, his father, and lived – and ruled – for only 5 days. Following the death of the baby king Philip V seized the crown, effectively disinheriting Louis X’s daughter, Jeanne. Although Salic Law was known in France, it generally related to property and had never actually been used to decide the succession to the crown. However, Philip V made certain that it would be from now on, by having the Estates General declare that women were not eligible to succeed to the throne of France. Unfortunately for the French royal family, both Philip V and his successor, his brother, Charles IV, only had daughters. Charles IV died in 1328, leaving his wife, Jeanne d’Evreux, pregnant; a regency council was set up to rule the country, until the child’s birth. However, Jeanne gave birth to a daughter, Blanche, and France had to find a new king. 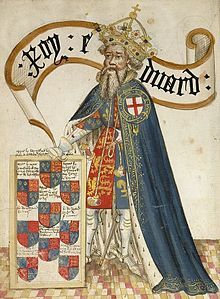 One candidate was Edward III of England. Edward was the oldest grandson of Philip IV through his daughter Isabella of France, Queen of Edward II of England. However, Edward III was only 15 years old and England – and Edward – were controlled by Edward’s mother, Isabella of France, and her lover, Roger Mortimer, who had deposed and possibly murdered Edward’s father, Edward II. Edward’s claim came through his mother – and he was English. As a result, they chose another as their king; the nephew of Philip IV, Philip of Valois, Count of Anjou and Maine. Philip was in his thirties, with a 9-year-old son, and had been Regent during Jeanne’s pregnancy. Edward III initially agreed to pay homage to Philip VI, who was crowned in 1329, for his French possessions. However, he was still a minor and under the tutelage of his mother and Mortimer. When Edward took control of his kingdom, in 1330, he had a change of heart. Irked by Philip’s support for the Scots, and encouraged by local conflicts in Guyenne, Edward questioned the validity of his oath to Philip, made while he was still a minor. And in 1337 Edward III declared war. Initial English successes devastated France: the French fleet was destroyed at Sluys in 1340, and Edward III ravaged the French countryside, in a great chevauchee. In an attempt to bring the French to battle Edward’s ‘scorched-earth’ policy saw towns besieged, convents and monasteries ransacked and the people displaced. 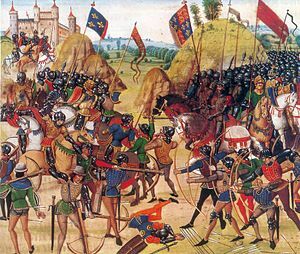 The French were eventually brought to battle at Crecy in 1346, where their cavalry was destroyed. The fall of Calais followed in 1347. In 1356, at the Battle of Poitiers, the English, under the Black Prince (Edward, Prince of Wales) captured France’s king, John II the Good. John was sent to England – where he died in 1364, still awaiting the payment of his vast ransom. 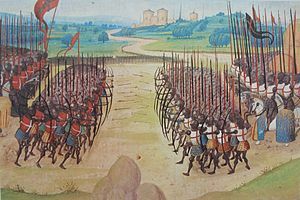 The 1360 Treaty of Bretigny was the crowning success of England’s war, with Edward III taking possession of almost a third of France. Although technically at peace, the two countries kept picking at each other – each supporting opposing factions in places of mutual interest, such as Brittany. In then end, with the failing health of the Black Prince, and and aging Edward III, a resurgent France emerged under Charles V; which saw English possessions reduced to a few ports and their environs by 1380. After 1389 truces between France and England were almost continuous. Richard II married Isabella of Valois, daughter of Charles VI, in 1396, as part of a 28 year truce. Charles VI had suffered from madness since 1392 and France had started to implode. The king was surrounded by bad councillors and factions, such as the Armagnacs and Burgundians, had riven the country apart with their in-fighting. Many parts of France were ruled almost totally independent of central government. However, with the turn of the century, the English had problems of their own and were unable to take advantage of France’s woes. Richard II was imprisoned and, later, murdered by the usurping Henry IV, who spent his reign preoccupied by troubles and rebellions in England. Henry IV and his son, the future Henry V were divided as to which French factions they should support; Henry IV preferred the Armagnacs, while the Prince of Wales supported the Burgundians. With the death of Henry IV, and the accession of Henry V, English ambitions turned to France yet again. Almost immediately, Henry laid claim to his inheritance in France. he made a pretense of negotiating for peace, while preparing for war. He would accept nothing less than the total reinstatement of the Plantagenet possessions in France. There is an, almost certainly, apocryphal story of Henry V taking up arms against the French after they jokingly sent him a set of tennis balls, suggesting that he stick to such ‘childish’ occupations, for which he had established a reputation during his father’s reign. 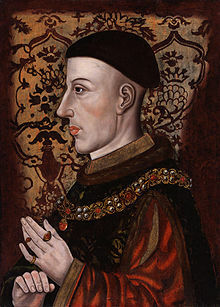 Henry saw war with France as a way of diverting the interests of the great nobles away from internal conflicts, thus restoring and maintaining order at home. With peace negotiations faltering, and having dealt with several plots to displace him from his throne – the last of which, the Southampton Plot was foiled in the first week of August 1415 – Henry V and his army arrived in Normandy on 13th August 1415 and laid siege to Harfleur. Harfleur held until 23rd September, by which time Henry’s army of about 10,000 was greatly depleted by dysentery. He was making for Calais – and England – when, on 25th October, he came face-to-face with the French. Article originally published on The Review in October 2015. You’re welcome, and a most chivalrous bow, m’lady. Good to see this post – and really nice to meet you at Harrogate Sharon. 600 years ago Henry V and his small army astounded the French, and the rest of Europe as well! Their courage deserves to be remembered – they truly were a Band of Brothers. I hope you enjoy 24 Hours at Agincourt – i try to do their achievement justice, and congratulations on your blog site – its great! With best wishes on this special day, Mike. Future learn has a free online class on the battle . I recently completed the Agincourt course at FutureLearn and it was deliciously interesting, I was so excited to stumble upon your post here that it compelled me to go over to the Book Review to read more. It reminded me of the course all over again and I love it. Wonderful! Thank you. I must say, researching for the post has made me want to learn even more about Agincourt. It’s a fascinating period of history. I surely do, it is a fascinating period because now I have a bit of a fascination for Henry V.
Me too – though I still don’t like Henry IV. I have a much less information about his dad H, the IV. All I know is he usurped the throne, haha. Pingback: The Colourful Career of Edward, 2nd Duke of York – History… the interesting bits!